Kathryn Wronski grew up in Boston in a family full of florists. From a young age, she loved working in her Dad's shop arranging and exploring with flowers. She credits her sense of color and composition from designing bouquets to weddings. With a four year degree in business, Kathryn attempted to find a niche in the business world that satisfied her but desks and computers didn't fulfill her need to be creative. After moving to California and raising two children, she started to take numerous art classes both at the area's college and from local artists. Gradually, getting her oil paintings seen in many local vendors and art festivals, her pet portraits became familiar to many. 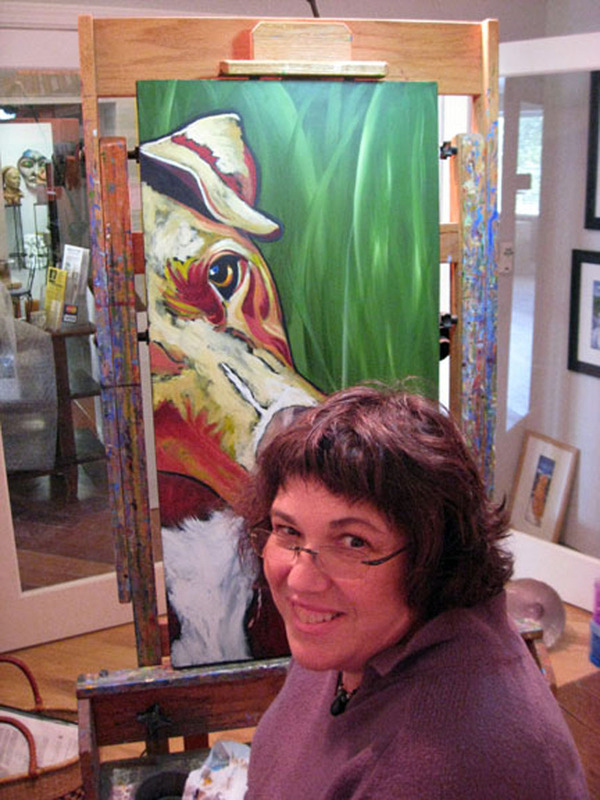 Her paintings are created with bright palettes and lots of whimsy capturing the animal's personalities. Recently, she has expanded her subject matter to include local scenes painted in the same style of her portraits, colorful and fun. Towns are captured on canvas using her choice as to the colors of the buildings. She wishes towns would employ the artists to determine the palette of the towns. Until then, she only dreams on canvas.